A segregated and militarized city. 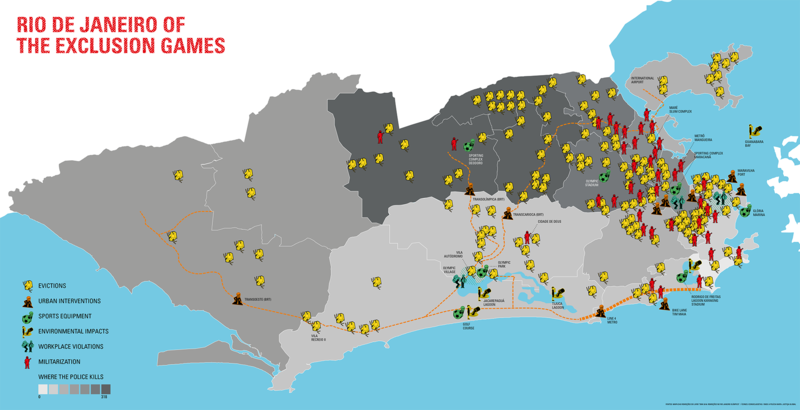 This is the legacy of the Olympics in Rio de Janeiro which, for the first time, is shown visually on a map with the removed communities, the occupied slums, the crimes against the environment and construction projects full of irregularities. The intention of the “Rio 2016, the Exclusion Games” campaign is to make clear the high cost to the city of this mega-event, not just financially, but in particular socially. This is also why movements, organizations and press conferences will be held in the ‘Jornada de Lutas’ (Journey of Struggles) which will occupy the city from the 1st to the 5th of August, with demonstrations, debates, speeches and exhibitions among other activities. The wounds that spawned scars on the “Olympic city”, such as the destruction of Atlantic rainforest to build a golf course and the removal of 77,000 people from their homes since 2009 (the year in which Rio was defined as the host city) are shown on the map, and will also be the focus of activities in the ‘Jornada de Lutas’. “Rio has been struggling against the effects of mega-events since the Pan American Games of 2007. Now, we have come to the end of an almost decade-long cycle, with Exclusion Games. As such, the ‘Jornada de Lutas’ is a chance to discuss everything that has happened in Rio and, to some extent, in the country, but also to strengthen the resistance against this model of a city which is ever more and more segregated.”, explains Giselle Tanaka, a member of the Exclusion Games campaign, also emphasizing that Rio will have major challenges to face after this period of mega-events. In this version, you will find the printable map containing more information, such as the names of places and texts regarding the violations (click here). Since 2009, the year in which the city was chosen to host the Games, more than 77,000 people have lost their homes in Rio. There are so many cases that it became impossible to name all of the communities in this map. Eduardo Paes removed families using deceptive arguments, such as the construction of expressways and the risk of landslides, without ever discussing alternatives to eviction, such as changes in routes and containment projects, with those affected. Some cases of eviction and resistance became symbols of this policy. The ‘Metrô Mangueira’ slum, for example, was removed for being less than 1km from Maracanã Stadium. Justification for its removal has never been officially presented. Right beside the Olympic Park lays the ‘Vila Autódromo’ slum. It was reduced from about 600 homes to 20, also just for being next to an area of intense real estate appreciation. Construction of the TransOeste express line, in turn, led to the complete destruction of the ‘Vila Recreio II’ and ‘Vila Harmonia’ slums (235 and 125 families, respectively) which, according to the city, took place because they were located exactly where the line would pass. Today, they are empty plots beside the TransOeste line, just waiting for the arrival of a new real estate development. This was the largest eviction process in the history of Rio. It is a policy which used the mega-events as an excuse and that will certainly use new arguments to continue the eviction process against the poorest strata of the population in areas of business interest. Construction projects for the Exclusion Games reached the extreme point of employing slave labor. In August of 2015, eleven workers were found in conditions similar to those of slavery in construction sites for the Olympics. They came from different parts of the country and were housed in a location without any level of basic hygiene. Responsibility for this falls on the contractor ‘Brasil Global Serviços’ which has construction projects in the ‘Ilha Pura’ project, the so-called Olympic Village, where the athletes will be housed. Since 2013, at least 11 people have died during construction of the Games. In London, in 2012, no deaths were recorded. The projects, such as the Olympic Village and Olympic Park, have been interdicted more than 40 times due to infractions of the law. Among the main problems are irregular workers, security problems and a lack of good working conditions. Traditional street vendors, known as ‘camelôs’, have suffered daily persecution by Rio’s city hall, a process that intensifies because of mega-events. In order to suppress them, Eduardo Paes uses the Municipal Guard, a clear misuse of its function. Cases of brutality and disregard for laws (such as unregistered seizures of merchandise, preventing the vendors from recovering what is rightfully theirs) are constant. The situation is repeated throughout the city, but occurs mainly in the downtown area. In addition, since the FIFA Confederations Cup, vendors are prohibited from working in the vicinity of Maracanã stadium, a traditional area for these workers on game days. Not a single pollution clean-up goal was fulfilled for the Exclusion Games. In the case of Guanabara Bay, the promise was made that 80% of the sewage pumped into it would be treated by 2016. That amount didn’t even reach 50% of the total. The cleaning and channeling of the rivers in the Jacarepaguá basin were outlined in the so-called tender documents for the 2016 Olympic Games, documents containing commitments made in light of the event. The projects were ceased in late 2015, after several delays. The companies Andrade Gutierrez and Carioca were awarded R$ 235M for this service, which should have been completed in 2014. There was also the promise of cleaning up the lagoons, especially Jacarepaguá, location of the Olympic Park, and Rodrigo de Freitas, site of the kayaking events. Regarding the first location, the State Environmental Department has already admitted that it will not be clean for the Games. Pollution also persists at the second site. A study performed by an international laboratory showed that there is a 99% chance of infection when just three teaspoons of water from the lagoon are ingested. Carbon offsetting has also not reached its goal. The replanting of seedlings has been sufficient to offset 69% of greenhouse gases associated with the construction projects of the Games. For the new Olympic City, major urban interventions were made which were to positively affect the city. The results, however, include a bike lane along Niemeyer Avenue collapsing, flood contention reservoirs at ‘Praça da Bandeira‘ plaza and Maracanã Stadium not functioning correctly and an LRV (Light Rail Vehicle) that cost billions for the use of a select few, while the buses, trains and subways are broken down. Maravilha port is the largest public-private partnership in the country, with the “public” providing the money and the “private” reaping the profit. Using R$ 3.5B the FGTS (workers’ compensation) fund for financing, the project caused the eviction of thousands of families and is under investigation for corruption regarding the contracts. The planned social counterpart, the construction of affordable housing, as well as being inadequate to even meet the needs of the evicted families, has not gotten off the ground. As for the new commercial buildings, there is no certainty regarding demand, which may lead to the area being renamed “White Elephant” port. The rapid transit bus corridors of the TransOlímpica, TransOeste and TransCarioca expressways were presented in an uncertain fashion, without public discussion, and already replete with problems. In the cases of the last two, reports of delays, difficulty in boarding, discomfort and overcrowding have already begun in the first days of operation. The TransOlímpica was interdicted less than a week after its inauguration, because a viaduct was threatening to collapse. To top it all off, the service is controlled by the same “bus mafia” that controls the other lines in the city. The ideal solution for transportation would be to employ the subway system in place of the rapid transit bus system. The extension of the line, however, has fallen behind, even with the modification to the new Line 4 route, which has become merely an extension of Line 1. Also, its cost is 21 times more than was initially forecast in the contract. R$ 9.77B have already been spent on this route (less than originally proposed), with another R$ 989M of spending required to complete the project. Not even sports have won out in the Exclusion Games. The stage for the opening and closing ceremonies, Maracanã, was conceded the Odebrecht, IMX and AEG companies, in a process which has been denounced by the MPF and MP-RJ. R$ 1.34B were spent on renovations for the mega-events, which were billed at R$ 181M, payable over 30 years. Sérgio Cabral is being investigated for having received kickbacks on this project. Maracanã stadium is part of a complex which also includes the Julio Delamare Water Park and the Célio de Barros Athletics Center. The two have been closed since the World Cup, serving as a materials depot and parking area. As such, established athletes and beginners were forced to seek new places to train, sometimes outside the Olympic City, even training on the street or not at all. In addition, Maracanã Village, located next to the complex, was taken over by the state, violently expelling the area’s indigenous people and supporters from that which is theirs by right. Many practitioners of athletics had migrated to the Olympic Stadium however this too had to be shut down in 2013, due to the risk of collapse. No company has been held liable for the irregularities in the structure. In the case of the Olympic Park, there are structures that will be dismantled, while those that remain will be privatized, in a process that sells the equipment purchased with millions from public coffers for nothing, and transformed into spaces for private initiative to promote brands, as in the case of the Multiuso Arena, which was transformed into the HSBC Arena. In the Guanabara Bay, there is Glória marina, also privatized in a process that completely ignored its sporting purpose. Not even the public access ramp to the water was left by the owner of the space, BR Marinas. In the case of the Lagoa Rowing Stadium, the Olympic Games transformed it into a training center for the sport, but all that remains as a legacy is the Lagoa shopping center which fills the stadium without leaving space for practitioners of rowing. The military occupation of the city is directly linked to preparation for the mega-events. The choice of the sites that have received UPP (Pacification Police Units, a project started at the end of 2008) was to create a “safety belt” for the World Cup and the Olympics, privileging the tourist areas, access corridors to the international airport and the city districts that have received Olympic equipment. This territory’s militarization has never had as its goal the safety of the inhabitants of these locales nor the expansion of access to public services, but the control of the poor and black people who are always seen as the enemy. The Public Security Budget of Rio State is greater than those of health and education. The government, in a “state of emergency” and not paying wages, received a loan of R$ 2.9B from the federal government, money that all goes toward Olympic suppression. In addition to the UPP, there is also the military occupation by the armed forces, which will be repeated in at least six slums during the Exclusion Games. In the 15-month occupation of the Maré slum complex for the World Cup, R$ 599M were spent. In comparison, from 2010 to 2016, the city of Rio has invested R$ 303M on social programs in the slums. The lines on the map correspond to areas of the Rio Military Police battalions. Immediately, the different colors on the map show that the violence of the state is not distributed equally across the population. Data from 2010 to 2015 show that, in the regions with the highest appreciation, the number of murders committed by the Military Police is absurdly lower than in outlying areas. There were 5 deaths in the region of the 19th Battalion (Copacabana) during this period. In the areas covered by the 41st Battalion (Irajá, Acari and Madureira, among others), the number jumps to 310, or 6100% greater. In all of the darker areas, the death toll reaches 300, while the in the lighter areas it remains at around 10 deaths. The mega-events are also synonymous with more murders committed by police officers. They increased 40% in 2014, the year of the World Cup, in relation to 2013. Just comparing May of 2016 to May of 2015, the growth was 135%, jumping 17 to 40 deaths. Showing police action in different areas of the city in a spatial manner is crucial to the understanding of how the state acts in slums and urban peripheries, revealing the racism entrenched in Brazilian society and its institutions. Translated from original by RIO2016 JOGOS DA EXCLUSÃO (unapproved translation).